Airfoil supports a full AppleScripting suite, so that just about anything you can do with the graphical user interface you can also script. The following is a brief overview of the object model that Airfoil exposes. For a complete reference, see Airfoil's Scripting Dictionary in Script Editor. If you are new to AppleScript, we recommend you pick up a copy of AppleScript : The Definitive Guide by Matt Neuburg, before proceeding. The primary object in Airfoil, is the speaker. It represents an Airport Express on the network, which you can start and stop and set the volume of. Before that though, we need to actually retrieve a speaker instance on which to operate on. Airfoil maintains a list of available speakers on the application object. 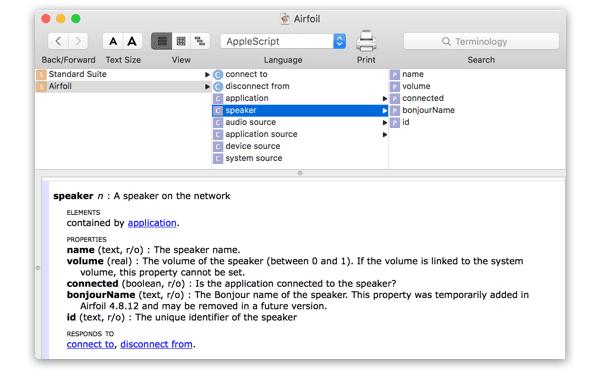 get first speaker --speaker id "0011245FA40D"
Beyond controlling the speakers, Airfoil's AppleScript dictionary gives you complete control over the audio source used. The five types of audio sources are all represented: application source, device source, and system source. set application file of aSource to "/Applications/iTunes.app"
set selectedDevice to choose from list listOfDevices with prompt "Choose an audio device:"
Finally, heres a complete script showing a typical usage of Airfoil. We find a target application, create a new application source for it, and then transmit it to a speaker. Example Remote Control scripts can be found and modified inside of Airfoil at: Airfoil.app/Content/Resources/RemoteControl/. Custom remote control scripts can be placed in ~/Library/Application Support/Airfoil/RemoteControl/. That's all for now. If you do something interesting with this, let us know! As well, if you have need for more AppleScript control, get in touch and we'll consider adding it.